This brown alga has a thin and narrow blade that can reach 35 cm in length but is usually less than 10 cm. It is light to medium brown and has smooth but slightly ruffled edges. It grows from a small disc-shaped holdfast. It also has a crustose stage, which forms under certain environmental conditions (long days and high temperatures). False kelp grows on rock as well as epiphytically on surfgrass and eelgrass (Zostera marina) from the mid-intertidal to shallow subtidal. It is found on shorelines not exposed to direct wave action. It is found on both sides of the North Pacific: its range extends from northern Mexico to the Aleutian Islands, Alaska, and along the Bering Sea to Siberia, Japan, China, and Korea. It is also found in the Arctic Ocean, coastal Chile, the North Atlantic, and the Mediterranean, Baltic, and North Seas. False kelp can be mistaken for young blades of Laminaria and Saccharina species; these true kelps have thicker blades than false kelp. 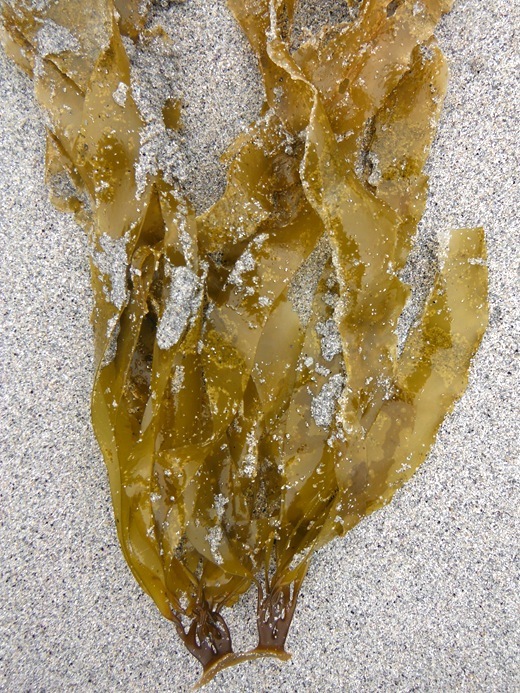 This species, a member of the Order Ectocarpales, has the common name 'false kelp' due to its similarity in appearance to true kelp species, which compose the Order Laminariales. Lindberg, M. and Lindstrom, S. (2010). Petalonia fascia. Seaweeds of Alaska. Accessed 27/01/2015. Petalonia fascia (Muller) Kuntze 1898. In Klinkenberg, Brian. (Ed.). E-Flora BC: Electronic Atlas of the Plants of British Columbia. Lab for Advanced Spatial Analysis, Department of Geography, University of British Columbia, Vancouver. Accessed 27/01/2015.